Crockpot Meatball Chili is a simple recipe that tastes complicated. If you like it spicy, add some crushed red pepper flakes or cayenne pepper. Another onion or more garlic would be good too, or you could add a can of chopped green chiles or jalapeño peppers or some fresh minced or chopped jalapeño peppers. This chili has a lot of vegetables, which makes it more colorful and nutritious than regular chili. You could certainly add more veggies. Some chopped yellow summer squash or zucchini would be delicious, as would chopped bell peppers. 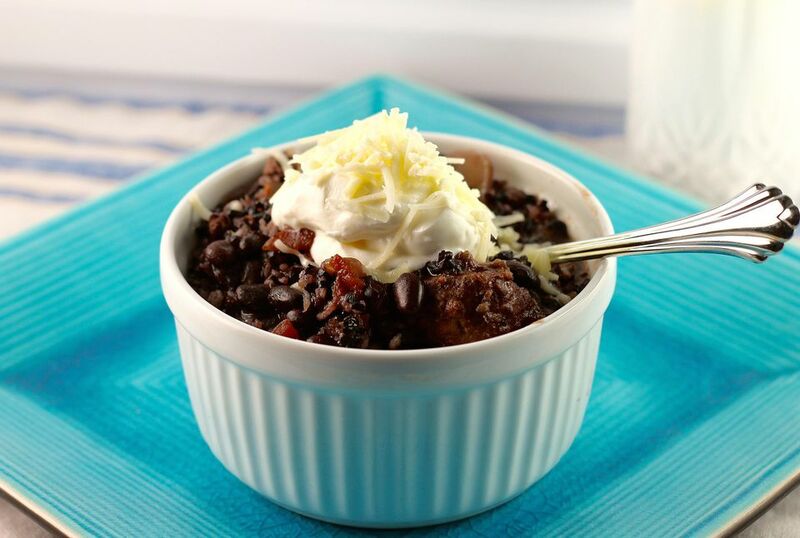 Serve this chili with some sour cream or guacamole for a cooling complement. Some fried tortilla chips would add a nice crunch and contrast. You can also serve it with a mixture of chopped tomatoes, avocados, green onions, cilantro, parsley, and lemon juice. Spoon some of this cool mixture onto each of the hot bowls of chili for a wonderful taste treat. You can make your own meatballs for this easy recipe, but precooked meatballs work just as well. Add them to the slow cooker while frozen; they will thaw and heat and be perfect by the time the chili is done. Serve this chili with a fresh fruit salad or a crisp and cool green salad, along with some warmed tortillas or breadsticks. A cold beer is wonderful with this spicy recipe, or iced tea is a good choice. For dessert, a cool lemon pie or ice cream pie would be perfect. Place the meatballs, celery, diced tomatoes, kidney beans, corn, tomato sauce, vegetable juice cocktail, onion, garlic, bay leaf, chili powder, cumin, and pepper in a 4-6 quart crockpot. Stir gently to blend. Cover the slow cooker and cook on low for 6 to 8 hours or until the vegetables are tender and the chili is hot. The meatballs will be hot and tender. If desired, you can thicken the chili by combining 2 tablespoons cornstarch and 1/3 cup water with a wire whisk, and blending it into the chili for the last half hour of cooking time. Garnish with fried strips of tortillas or crushed tortilla chips, if desired.